Call it a first step in the right direction. The World Anti-Doping Agency (WADA) is removing cannabidiol—the pain-relieving, non-psychoactive cannabis compound—from its list of banned substances in 2018. WADA, which governs drug testing in the Olympics, also sets the standard for anti-doping guidelines in many sports leagues, like the Ultimate Fighting Championship (UFC) and others around the world. Currently, under the United States Anti-Doping Agency and UFC rules, cannabis and its metabolites are prohibited. 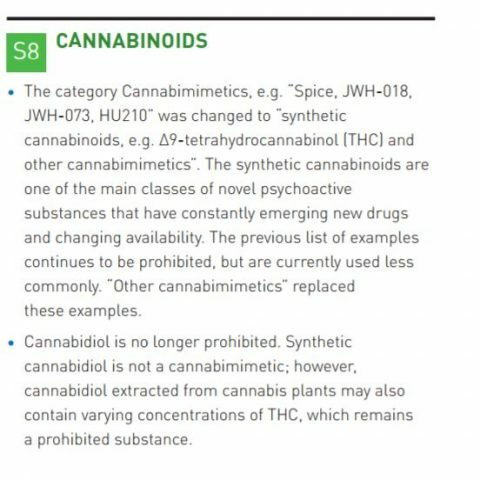 Starting next year, however, CBD will be allowed, while synthetic cannabis and cannabis products rich in psychoactive THC will remain banned. Each year WADA releases a prohibited list of banned substances, as the agency frequently looks at changes in the medical world and relates them to its banned substance list. How big of a deal is this? Cannabis-friendly athletes like Nate Diaz, who garnered worldwide attention after vaping CBD at a post-fight press conference, should be pleased with the news. He and his brother have been cannabis advocates in the mixed-martial arts world for more than a decade. Diaz was given a public warning by USADA after he admitted to consuming CBD in competition during the press conference, while his brother Nick was suspended for five years by USADA after repeatedly failing drug tests for cannabis in 2015.